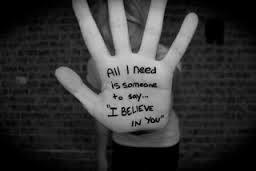 … as long as YOU believe in you. When it comes to living your life, YOU are the authority. Never give your power over to anyone else to make you feel badly about yourself. No one has control over your life unless you give it to them. If you give your power over to other people to prioritize their judgments/ opinions of you, then you lose yourself. You have no one but yourself to blame if you choose to buy into other’s opinions over your own. It is always a choice. No one’s judgments or opinions should matter to you unless they support your view of yourself. If they do not, they should be kindly disregarded. Don’t waste your time feeling insulted, misunderstood or slighted. It is not worth your energy. Every time you choose to put your energy there, you take it away from building the beautiful being that you are and/or want to become. It’s your life and your path to walk every day. Those people will always come and go into your life, but you will be the one left standing and upholding their judgments/opinions long after they’ve left. So ask yourself if that is what you want to be doing. Make a better life for yourself and decide today that you will only accept perceptions that are authentic to you and which support your positive growth. If those perceptions do not, throw them out and replace them with more suitable options. The only thing we have in life are our choices. Learn to choose wisely and not give your power over to anyone else to malign you or take you down. Life is too short to play out other people’s perceptions of you. Time to live your own.